Tubber Minor Club officially started only a mere thirteen years ago in 1997, but the clubs involvement with underage goes as far back as 1979 when we took to the field at under fourteen level under the stewardship of Marty Healy, Des Higgins and the late Tommy Nestor. 1980 also saw us take part in the championship with two teams at Under 14 and Under 16 levels, with the management of Tom Nestor (RIP), Cormac Kelly, Gerry North and Kevin Higgins. In 1982, after joining Durrow under the name of Colmcille Gaels, the first piece of silverware came to the club when we defeated Clonbullogue by 2-8 to 1-7 in the County Minor Final and thus laid the foundation for the clubs Junior title win in 1986. Unfortunately the silverware in the early days was few and far between. 1983 saw Colmcille Gaels reach their second Minor Final in the space of twelve months, but Doon proved to be too good for us on the day. Later in the year our under 21 team made real headway in the championship by reaching the County Semi-final but were unlucky to be beaten byTullamore. Our under 14's also reached the County Final in 1986 only to lose out to Shannonbridge, while also that year our Under 21's lost the County Semi-final to Ferbane. U14 County Final under the leadership of Pat Egan (Tinnymuck) we came out on the wrong side of the scoreboard following a thrilling replay against Doon. 1987 rolled into 1988 and once again we reached another County Final, this time at U16 level.We took to the field in O'Connor Park, with ambitions very high, but Pullough proved to be too strong for Pat Egan (Tinnymuck) and Joe Grennan's charges. The playing fields of 1989 weren't too good for the club, but we had the great pleasure of Gerry Robbins representing us with great distinction on the Offaly Minor panel and collecting a Leinster Minor medal. In 1992, the club formed another amalgamation this time with Erin Rovers. Playing under the name of Erin Rovers Ãg, we played with our near neighbours until 1996. In that time we reached the U16 and Minor Finals in 1992, but once again luck wasn't on our side with Daingean defeating us in the U16 and our other near neighbours Ballycumber defeating us in the Minor. 1993 was much the same, this time we lost out to Gracefield in the Minor, but a new wave and pedigree of player started to emerge, namely Brian and CiarÃ¡n McManus, Conor McGuinness, CiarÃ¡n Lowry, Damien Heavin, Fergal Egan, Eamonn Reilly and Mark Cornally who all featured on the final team. 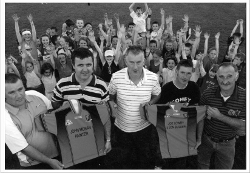 From 1993 to 1996, we played with Erin Rovers, but in 1997,Tubber officially started their own Minor Club. It was decided at that first AGM that we would have our own Under 12 team with no amalgamation and from there we have never looked back. On Friday 17th January 1997 the then Chairman Tommy Colgan and Secretary James Farrell met with Ballycumber with a view to playing underage football with them. Ballycumber were 100% committed to the amalgamation and the proposal was taken to the County Board. combination had to stand as it would cause delays in the Under 21 Championship. As a result we decided to run a minor tournament for our players and with teams coming from Tubberclair, Ballymore and St Joseph's we ran a very successful tournament on a home/ away basis. Our only team affiliated that year was our under 12's who did remarkably well to say the least. Reaching our first county final in years the excitement was huge.All roads lead to Rahan on 28th September, but facing a very strong Kilcormac/Killoughey we were very unlucky to lose by three 0-6 to 0-3. But even though the result didn't go the way we wanted, it did start years of success for the Tubber/Ballycumber combination. Granted 1998 didn't see the combination get off to a winning start, when our Under 12's were beaten in the shield final by Kilcormac/Killoughey but it wasn't long until the winning floodgates opened for us. 1999 saw the first piece of underage silverware to come to the club in years when we defeated Birr in the U14B Final winning by six points in the end 0-16 to 2-4. The turn of the Century saw us reach the U14B Final again, but this time we were beaten by Kilcormac/Killoughey. In 2001 thanks to a "wildcard" we had the distinction of representing the county at the National FÃ©ile Finals in Kilsheelan, Co Tipperary where we reached the semi-finals. In what was a wonderful weekend it was duly topped off with Shane Kelly being crowned the Skills Champion of the Tournament. 2002 was another year of disappointment when we lost the U14B Shield Final to Ballinamere/Durrow, but more disappointment was set to follow in the form of the Minor. From 2002 to 2004 we reached the three County Minor A Finals, only to lose out on all occasions to Rhode ('02) and Tullamore in the other two. 2004 also saw us lose the U16 Final to Ferbane after a replay, while we also lost out in the U12 semi-final to St Rynagh's after a replay, but despite all the disappointment what it did give was the belief to keep going and on 12th September 2004 all the efforts of the club came to the fore when we won the U14 Final, beating Gracefield by 3-5 to 1-10. 2005 was another great year for the club when we beat Birr by 1-12 to 2-3 in the U14B Final and Ferbane in the U16B Final by 1-9 to 1-7. Silverware was back in Tubber once again. Unfortunately 2005 also saw us defeated by Birr in the U12 County semi-final and since then matters on the playing field hasn't brought us too much silverware. In 2006 we did reach the Minor Quarter Final only to lose out to Kilcormac/Killoughey who that year reached the County Final, while it was in 2006 that we made our last final appearance when we lost to St Broughan's in the U16B Final. To those who had the vision of a Minor Club, our years of success are down to you and hopefully more and more years of success will come to us. Andrew Minnock; James Guinan, Lorcan Halligan, Patrick Molloy; Joseph Condron, Ger Egan, Stephen Keena; Diarmuid Donoghue, Edmund Kavanagh (0-1); Fergal Daly (0-5), Joseph Higgins (0-1), Adrian Kelly (0-5); Daniel Boland (0-1), Leo Guinan (0-3), Nicholas Egan. Subs: Keith Higgins, Shane Kelly, Donal Lynam, Liam Hackett, David Kelly, David Kavanagh, Emmett Kelly, and Gary Delaney. Management: Joe Higgins, JJ Guinan, Len Casey, Jimmy Donoghue, Eamonn Kavanagh. Joe Walsh; Olsen North, Chris McDonald, Ethan Keena (0-1); Nigel Farrell,Aaron Daly, John Egan; Colin Daly (1-0) Lee Dunning; CiarÃ¡n Farrell (1-0), Martin Larkin, Richie Dunne (0-1); Keith Lawlor (0-1), Bernard Allen (0-1), Eric Farrell (Capt) (1-1). Subs: Lee Colgan, Danny Kelliher, Eoin O'Hara, Gary Larkin, Shane Kinahan, Brian Guinan, Andrew Connor, Liam Daly. Management: Aidan King,Willie Allen, Pat Dunning. John O'Brien, Niall Quinn, Ethan Keena, Eamon McCabe, Nigel Farrell, CiarÃ¡n Farrell, Lee Colgan, John Egan, Richie Dunne (0-2), Shane Kinahan (0-1), Stephen Larkin, Gary Larkin (1-1), Danny Kelliher, Bernard Allen (Capt) (0-6), Brian Guinan (0-2). Subs: Andrew Connor, Colm Casey, Ciaran Allen, David Egan, Sam Lawlor, Ben Wilson. Management: Willie Allen and Aidan King. Neil Hiney, Lee Dunning, Eoin Johnson, Richie Dunne, Olsen North, Colm Daly, Aaron Daly, Brian Kelly, Noel Browne, Peter Dunne, Conor Cribbin (0-2), Aaron Farrell, Keith Lawlor (0-1),Adrian Hiney (1-4), Eric Farrell (0-1). Subs: Chris McDonald, Bernard Allen (0-1), Joe Walsh, Danny Power, Martin Larkin, Ethan Kenna, Ciaran Farrell, Liam Daly. In 2001 the Tubber/Ballycumber under 14 team took part in the All-Ireland FÃ©ile in Tipperary.Tubber/Ballycumber was hosted by Kilsheelan of South Tipperary.They were in a group with The Nire of Tipperary, Kilsheelan and O'Curry's from Co. Clare.They won all of their group games to advance to the All-Ireland semi-final.The faced Erin's Own from Kilkenny in the semi-final.The match was played in Golden but the Kilkenny side emerged as deserving winners. The All-Ireland FÃ©ile was a huge occasion for Tubber/Ballycumber GAA and they were a part of the grand parade around Semple Stadium at the opening ceremonies.